I woke up in Mamaw’s bed that morning as usual. She was still walking then. It must have been a Sunday, because Bill and Nell were not at work. I called my parents Bill and Nell because that was their names. I looked out the window and it was still dark outside. I could see part of the moon through the branches of the pecan tree in the backyard. It was a silver sliver up high in the sky. All around it were stars. The stars were my friends and I always liked looking at them, although in those days I went to bed pretty early. My friends came out later. I knew that this day was going to be special. We were going to Lookout Mountain. I had never been to Lookout Mountain before and we would be taking the car. I would get to sit in the back seat next to my grandma the whole way and back again and Bill would drive. Nell would sit next to him in the front seat. Bill always had a big Thermos® bottle full of hot coffee next to him on the seat. Bill never drove anywhere in a car without a Thermos® bottle full of coffee and a few sandwiches. This day, the sandwiches would be Pimento Cheese. The same ones I had watched my Grandma making the day before. I didn’t especially like Pimento Cheese sandwiches and I probably told them so. But there were Ritz crackers and cheddar cheese for me. Bill had been the first one up that morning, followed by Nell. Bill came in to my Grandma’s room to wake us up for the trip, but I was already awake. I’ve always been a light sleeper. There was a certain amount of hustle and bustle in the house, but I wasn’t a part of it. Bill and Nell had a few things to do around the house before we could leave, but it wasn’t too long before my Grandmother, my Mother and I were standing outside the front of the house and Bill was backing the car out of the driveway. My grandmother opened the door and got in. Then I guess my Mother handed me to my Grandmother. I was still too small to reach the running board. Then My Mother got into the front seat and Bill backed up the rest of the way into the street, turned the steering wheel to the left and slowly headed west on 51st Street. It was just getting light out. There were no other cars on the street. Everyone else along the block, The Thomases, The Owens, The Pilgrims, The Bailey’s were all still sleeping. We hadn’t gone too far, in fact, we were only at the corner of Harmon Street when my father saw Jack lying in the middle of the street. Jack was our orange cat. He had been hit by a car. My grandmother was very upset. I was a little upset, too. I liked Jack. He was a pretty independent cat. He seemed to know his way around. Jack had been there before I was and I kind of looked up to him. There were various cats living in the rafters of our garage in those days. You could see their footprints on the trunk of the car or on the hood. They would jump up onto the car and then jump up into the rafters of the garage. That was their home. Jack and the others, I never knew their names, lived in our old brown wooden one-car garage that had come with the house. Some had probably even been born there. I don’t know how they got up and down when the car wasn’t in there, but it wasn’t one of my concerns. They had picked the place and that’s where they lived. Jack was allowed in and out of the house, but the other cats weren’t. Jack was special. My father stopped the car and left the engine running. Nell and my Grandmother and I waited inside while Bill got out. He picked Jack up and handed him to my Mother. I looked over the front seat at him. Jack’s eyes were closed and he had a little trickle of blood coming out of his mouth. But he was still breathing, so my father turned the car around and we went back home. My grandmother and I waited in the car while Bill and Nell got out. Bill put Jack in a cardboard box on the back porch. Then Bill and Nell got back into the car and we started out all over again for Lookout Mountain. Once again we passed the place where Jack had been hit, and my father allowed as how he thought Jack was just “stunned” and would be all right. I hoped so. I liked Jack. 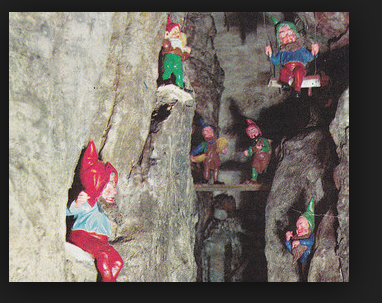 To be perfectly honest, I don’t remember much more about the trip except that they took me to see some gnomes or dwarfs, like ones in Snow White, except these gnomes or dwarfs, I’m not sure which they were, didn’t move or talk. They just stood there. The only other thing I remember was my father showed me a glass door in the place that had an “electric eye”. It could tell when someone was coming and it would open automatically for you. Bill was somewhat impressed, but I was a little apprehensive about a door with eyes that could see you. I never did get to see the mountain although I looked for it. The next thing I remember was being back home again. It had been a long trip. Bill and Nell and my Grandma were all quite tired. But I felt fine. I wasn’t tired a bit. I think it was because I slept a lot in the car. While the others were unpacking and going in the house, I broke free and went through the front door and directly to the back porch to check on Jack. There was the cardboard box with the piece cut out for a door. But where was Jack. Had he died? Do cats disappear when they die? My grandfather had died and he disappeared. Maybe Jack had died, too. I was sad. There was only a white towel with a little spot of blood on it where Jack had been. Then I felt something soft and warm rub against my leg. Jack had been in my Grandma’s bedroom and had come to see us when we got home. I was relieved to see him. Then, suddenly I, too, felt tired– and I went into my Grandma’s bedroom and lay down on my side on the bed. I put my head on the pillow and it was warm there. Jack had been sleeping on my pillow while we were away. While I lay there thinking about the gnomes, Jack hopped up on the bed and curled up next to me. I reached out and petted him on the top of his head.